We perform both nationally and internationally in order to showcase Nankin Tamasudare, a traditional Japanese street performance, to people around the world. We hold the Guinness record of “the largest parade of people performing Nankin Tamasudare,” which we challenged in May 2013. We look forward to seeing all of you at the Honolulu Festival! We have been performing Japanese traditional art, “Nankin Tamasudare” (A street performance in which the performer transforms a specially-made bamboo screen into various shapes while chanting an accompanying poem) in Japan and all over the world to entertain people from everywhere. This art form was registered in Guinness World Records in May 2013. We are looking forward to meeting all the participants of Honolulu Festival. It is our joy and also our dream to share Nankin Tamasudare, a traditional Japanese street performance known from ancient times, with the people throughout the world. All of the members of our group are looking forward to meeting with spectators from all over the United States as well as the Honolulu staff once again. 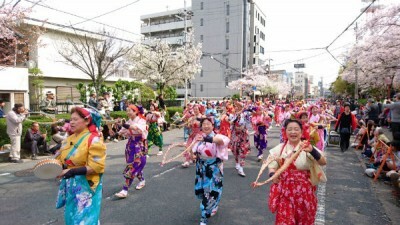 Please enjoy the Tamasudare Parade, an event that was recorded in the Guinness Book of World Records in May 2013. It is our desire to share the time honored traditional form of Japanese art known as “Nankin Tamasudare” with the people of today, the future and those throughout the world. This is also our dream. We are excited to be able to perform in Honolulu, and once again meet the people who gather from all over the world for this event as well as the Honolulu staff. We are Nankin-Tamasudare and we perform our traditional street entertainment all over the world. We will start off this year by performing at the Honolulu Festival. Then in April we will go to Hanoi to celebrate their 1000th Anniversary since the relocation of their capital. In May there is the World Expo in Shanghai. We always feel like it’s the first time in Hawaii no matter how many times we return. 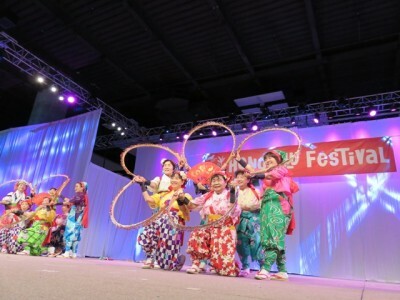 We will enjoy our sixth appearance at the Honolulu Festival! Wearing bright colored costumes and carrying shining bamboo sticks, our group hopes you to enjoy our rhythmical performances in which we create various shapes by skillfully changing the position of bamboo sticks. Regardless of age and nationality, anyone can enjoy our Bamboo Stick Performances. This is the well known street performing art called “Bamboo Stick Performance.” Its techniques keep advancing, and we are practicing as the art becomes more and more sophisticated.